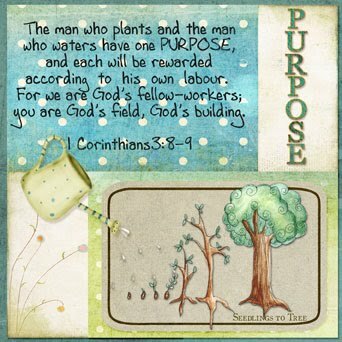 For this fortnight Patter gave us the word "Purpose". Our purpose is to glorify God and I chose this verse because of the great commission the Lord gave us to go out into the world and make disciples. We are to sew seeds wherever we go. We may never see the result of the seed we sew but we are to still sew it - that is share God's word - be a witness for Jesus in all that we do and say. Seedling to Tree sticker by Faith True; Alpha by Paula Wright and all the other - papers, watering can, water drops come from a kit called Happy Garden by Vera Lim. Love how you used the watering can here! Perfect for "purpose." And the verse is a wonderful, wonderful choice too. Such a gorgeous page! Have a blessed day!